I do eat vegetables and other foods. I really do. I just don’t post them that much on this blog (which I intend to change soon) because seafood dishes are a lot more photogenic than, say, tofu, beans, turnip, chicken with skin and bones. I am partial to seafood, but I also love my greens, poultry/pork, eggs, soy products, and other foodstuff. 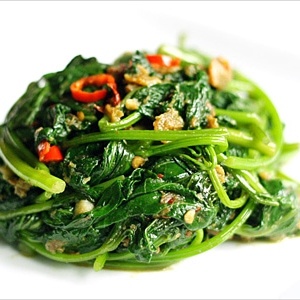 One vegetable dish that I simply can’t do without in my cooking repertoire is a signature Malaysian dish called kangkung belacan or stir-fried water spinach/morning glory with shrimp paste, even though it means that I have a stinky house! For today’s creation, I used yam leaf/sweet potato leaf (蕃薯叶), which works as well as water spinach. While it might seem or look simple, perfect execution is not easy. Wok hei (the breath of the wok) and timing are exceedingly important; a little too much wok hei or a tad too long in the wok can render the dish a complete failure, for example: burned belacan that tastes bitter or overcooked vegetables that look purple-ish in color. While I love this recipe, I must warn you that it’s an acquired taste, especially for an American palate. However, it’s well worth a try because you probably can’t find another vegetable dish as intriguing or delicious as this one! 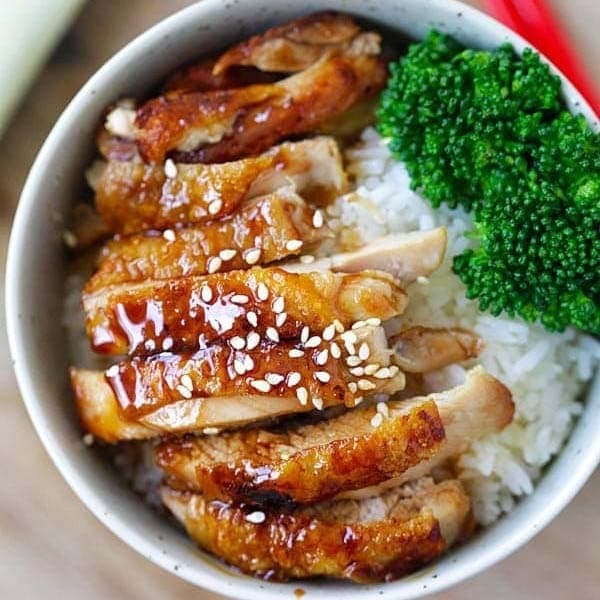 Other signature Malaysian recipes\ can be found here. Belacan Yam Leaf (Sweet Potato Leaf) recipe - A signature Malaysian dish called kangkung belacan or stir-fried water spinach/morning glory with shrimp paste. The key ingredient is none other than belacan, the Malaysian variety of shrimp paste. Grind the dried chilies and cooking oil in a blender. Add a little water while blending. Heat the wok, pour some cooking oil and stir-fry the chili paste for about 3 minutes. Set aside. Soak the dried shrimp in warm water for 10 minutes, then coarsely pound them using mortar and pestle. Set aside. Cut the stems of the yam leaf. Keep only the tender part of the stems. Rinse with cold water and then set aside. Fire up the wok to HIGH heat and add the cooking oil. Wait till smoke comes out from the wok then add in the chopped garlic. Do a quick stir, add in the belacan, dried shrimp, and roasted chili paste and continue stirring. As soon as you smell the pungent aroma of belacan, toss in the yam leaf. Stir continuously until the leaves started to wilt. Add in a few dashes of fish sauce, continue stirring (make sure the color of the vegetable remains green). Dish up and serve hot. In the US, sweet potato leaf (蕃薯叶) is marketed as yam leaf. If you use water spinach, the recipe works the same. Dried shrimps should complement the belacan instead of competing with it, so you don't want to use too much of them. Only you could make shrimp paste look so completely divine – gorgeous photos! That is the cutest belacan scoops I’ve ever seen! Great pics! I love anything with belachan, but don’t use it often because of the smell that lingers long after the meal is done. i am also malaysian now living in china. i had some stir fried vege with belacan yesterday at a singaporean restaurant cooked by a malaysian chef and it was a taste of home! Wow, was wondering when you were gonna get to this dish. It’s my all-time fav vege dish to order when I eat out. Will need to try making this soon. Only you can make the yam leaf look so appetizing. Well done! The finished product looks superbly delicious. But would the vegetable be sweet potato leaves instead of yam leaves? I have eaten the former and the dish is superb. I also like this dish a lot. Best to do at home since the restaurants typically charge US$8-9 for it, and I bet it’s worth to do it at home, WITH the stinkyness. I wondered what was yam leaf – I thought it looked like kangkong (which is what we called it in the philippines) – then upon reading your post II guess it’s a substitute for Kangkong. Oh and with shrimp paste – this is exactly how I like it. Scrumptious pics! Could you tell me where I can buy belachan in north California (San Jose)? I can’t find it at the local 99 Ranch. Thanks very much! Easy to grow! If interested i can share. I am in San jose! This is one ingredient which will tell the neighbourhood what you’re cooking! Real adorable balls of belacan. I love stir fried greens, spinach and swiss chards in particular. But I knew about neither yam leaves nor Belacan. Looks like an interesting combination. I’ll try it when I have a chance. Thanks for the recipe and the beautiful picture. Like your blog very much. Good photos, good layout, and good recipes too. I would like to share some cooking tips for your consideration when preparing food using belachan. Toast belachan over direct fire till aromatic, then dissolve it in some water into a paste. This will bring out the taste of belachan. Another way is to toast it in a dry clean wok till powder form. Do this just before cooking, not in advance. Ari, Amy, East Meets West Kitchen, Mandy – Thanks. Yeah, I tried to trick people in believing that those scoops are ice cream! Hehe. Andaliman – cassava leaves? What are those? K & S – Thanks. Tracy – Yeah, you can try my recipe at home, just make sure you “smuggle” some belacan into China the next time. I am not sure if you could get it in China or not. Lucy – I checked out your blog, it’s fanstastic. Love the dishes you cook. Bayi – yam leaf = sweet potato leaf. Sweet potato is marketed as yam here in the US, and yam is called taro here. Don’t ask me why. Hehe. 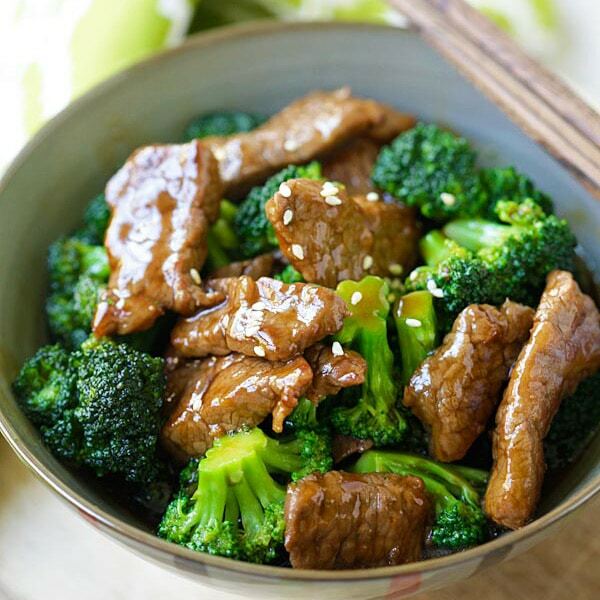 Zlamushka – that’s probably Chinese style if oyster sauce is used, but yeah, Thailand has the same dish too. Ironeaters – yep…just pluck from the garden and cook it…I miss those days too, but lucky I can get them here in California. Tiga – You know, if shrimp paste is ever on Iron Chef, I am sure one of the iron chefs will definitely make it into an ice cream. LOL! Veron – wow, I didn’t know that kangkung is called kangkong in Tagalog. It looks like we share some similar words…no wonder I always thought I can undertand Tagalog (from the sound of it) but when I paid attention, I can’t. Hehe. BSG – I agree, they taste similar. In fact, I prefer sweet potato leaf. Jasmine – you should be able to find belacan at the R99. It’s probably not made in Malaysia, but you can get the ones made in PH or made in Thailand. Tummy – yep, it’s a loud statement to my neighbors…but they probably think I have a dead animal in the house. my first time here! i live in the west coast. i remembered when my uncle told me he cooked belachan in his apt in UK. the neighbors thought there was a dead rat!! Fantastic webpage! I’ve been looking for a great Malaysia food blog. I’m bookmarking it, and thanks for visiting my site. i dont think i’m a big fan of belacan paste but they sure do look very nice in your picture ! I have Thai shrimp paste that I bought and used recently to make a sambal I saw on Eating Asia blog. Recently I’d been feeling that I’m neglecting using my shrimp paste for other things but now I see you use it and stir-frying veggies, I am so going to start using it that way when I’m cooking my veggies, which happens regularly. I don’t care what anyone else says about belacan, I love it. Kankung belacan is always one of the dishes I order whenever we eat out at a Malaysian restaurant. But yam leaves / sweet potato leaves are a little less chewy / fibrous. The best choy over all would be Sabah choy but it’s so hard to find, even in M’sia. I’ve seen belacan at the Ranch 99 in the aisle where they have all the Indonesian condiments. Or you could use Chinese harm-ha for an approximate flavor. This is one of my favorite veggie dish that grandma makes. I love it =) Brings back memories. Awesome, picture perfect down-home Kampung vegetable. btw, no Okra nor Mani chai this season, three rows of special breed okra was attacked by bad bunnies in one night and I only manage to harvest a spoonful of Mani chai before the cold season kicks in….but the spoonful of mani chai tasted so good with a little egg and 江魚仔. This looks very delicious…and creative. I was so excited to come across your blog and it brought back fond memories of all the foods back from Malaysia. You have excellent pictures and I just love your recipes and since I don’t really know how to cook, your recipes come in handy. Hello. I stumble upon your web page when I am looking for nyonya PERUT IKAN curry recipe. I am hoping to able to cook it. Finding that lengkalok leaf is big task in KL, Malaysia. Wonder how u find in in US ? arent you based in US now ? I browse thru your website & love all your food photographs. They so beautifully delicious. U r good at it. I am so excited to learn that you can use the patato leaf to make a healthy meal. Thanks a lot for your blog it is very handy. I miss having yam leaves with belacan. I just bought some belacan and will use your yam leaves with belacan recipe. We always order kangkung belacan in the restaurants and finally made it ourselves. We used this recipe and our kangkung belacan turned out great! Thanks for the recipe! Looks so yummy. If yours comes out a bit salty, I recommend drizzling it with few drops of lemon. Found a short cut for the sambal paste, and it tasted yummy! Substituted with instant sambal belachan paste from prima taste sold in supermarkets. Try it! 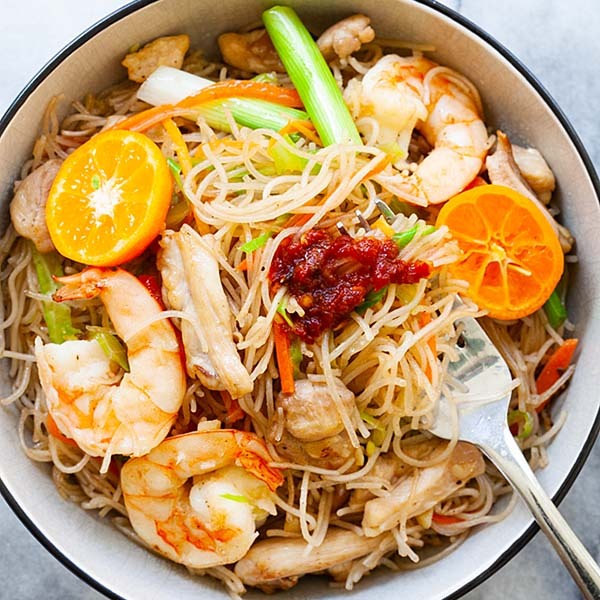 hi there – thanx so much for these recipes – i am half malaysian, living in UK and about to do a dinner party 1st time cooking this dish which i love BUT – the smell is so strong – wondering if i can part cook it before and then just reheat?! Will that work or will veg be awful? pls with any suggestions as doing this in 2 days! Hi Jeff, yes the smell is strong there is no way to escape the smell if you want to cook with belacan. Terima Kasih! Love your all your recipes. I am a former Sabahan now living in the US and prefer to cook Malaysian dishes more often whenever possible. In fact, in the spring, I planted my own Kang Kung in my garden. Whenever I cook dishes with Belacan, none of my friends would come visit me. Hi John, thanks for trying my recipe. 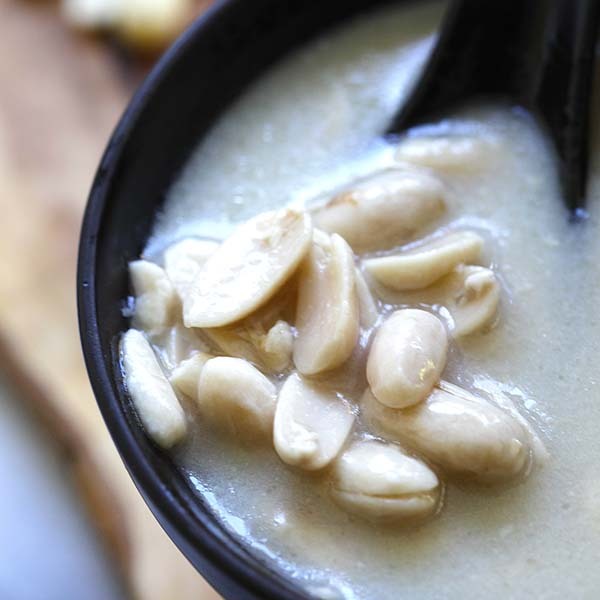 This is the kind of recipe I really love, and I have belacan in my pantry. Thank you! Thanks Kortez. Belacan is amazing.